This was an important event for us. 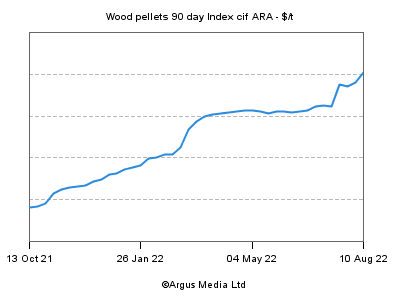 Japanese wood pellet imports have grown almost six-fold in the period from 2014 to 2017, and growth is expected to accelerate until at least 2025. Canada shipped 360,000 tonnes of pellets to Japan in 2017, up from just 90,000 tonnes in 2014. Canada currently holds a 70 per cent market share for wood pellets in Japan. Our objective at the CMT conference this year was to continue to brand Canada as a preferred supply source, emphasizing our sustainable fibre sourcing, high product quality, reliable and efficient supply chain, and creditworthy producers. We aim to continue increasing exports to Japan and to maintain our market share. From May 12–13, for the first time ever, WPAC — with the support of Sumitomo, Pinnacle Renewable Energy, Pacific BioEnergy, Premium Pellet, Fibreco, and Tolko Industries — hosted a hugely successful golf event in nearby Ishioka for about 30 Japanese and South Korean customers. Festivities included dinner, an evening of karaoke, and a golf tournament at Summit Golf Club. WPAC members provided significant conference content. I assisted with setting the conference agenda and recruiting speakers and moderators. Canadian presenters included Pinnacle’s Scott Bax and Vaughan Bassett, Pacific BioEnergy’s Paul Kalil, and Fibreco’s Kerry Lige. On the evening of June 15, WPAC hosted a reception. In addition to the conference delegates, we invited our entire Japanese customer network. We dubbed the event Canada Wood Pellet Day. We decorated the ballroom with Canadian flags, banners, streamers, and balloons. The Canadians began the night wearing Canadian hockey sweaters and flag hats, but had to give them up to our Japanese guests who proudly wore them and then took them home as souvenirs. Following the conference, a group of WPAC members visited the 49 MW Keihin Biomass Power Plant in Kawasaki for a first-hand view of Canadian wood pellets being used to create Japanese electricity. Keihin Biomass consumes a 50-50 blend of Canadian pellets supplied by Pinnacle Renewable Energy and Pacific BioEnergy (approximately 100,000 tonnes per year) and Indonesian and Malaysian palm kernel shells. There were a dozen key conference takeaways from the various speakers. Issea Sawa, Japanese Biomass Power Association: The national target for renewable power is 22–24 per cent by 2030, of which biomass power should comprise 19 per cent — i.e. 4.5 per cent of total electricity. This will require 7–10 times the amount of biomass consumed in 2017. Paul Kalil, Pacific BioEnergy: The reasons that Canada is a preferred wood pellet supply source include: close proximity and efficient logistics; ample secure sustainable feedstock; reliable and safe transportation infrastructure; safe manufacturing that results in high-quality product and uses best available technologies; well-funded reliable ownership; and economic and political stability. Yasuhisa Okamoto, Sumitomo: Legality, traceability and long-term sustainability are the most important factors to Sumitomo for raw materials. This is why they decided to make a major investment in Pacific BioEnergy. Sumitomo has been importing wood pellets and wood chips for the big regional power utilities since 2008 and continues to acquire many supply sources to ensure stability for the long-term. Sumitomo’s share of wood pellet import volume to Japan was 55 per cent in 2017. Sumitomo expects Japanese wood pellet demand by 2030 will be 15 to 20 million tonnes. They are looking for 15–20 year term contracts. Shuji Aoki, NYK Carriers: NYK accounted for 140,000 tonnes of wood pellets being imported into Japan in 2017, some 27 per cent of Japan’s total. From Western Canada, NKY uses vessels with total DWT of 28–38,000 tonnes and pellet carrying capacity of 24–32,000 tonnes. Kerry Lige, Fibreco: Export terminals have an integral role in the wood pellet supply chain. Terminals manage receiving and unloading rail cars, storage, and vessel loading. He discussed considerations for storage, soft handling to maintain product quality, fire and explosion hazards, off-gassing, and dust management. Henry Pease, RWE Supply and Trading: Wood pellets are now traded globally. As RWE is a large European buyer, it has the ability to supply both Japanese and European markets. RWE sees Canada as a swing supplier. RWE can purchase cargoes from Western Canada, then make the decision regarding which direction to send them. Yoshiomi Todo, Nippon Paper Energy: NPI has two biomass power plants — Yatsushiro Power Plant, 6 MW, completed in 2015 and Ishinomaki Hibarino Power Plant, 149 MW, completed in 2018. NPI requires evidence of forest certification. They prefer to receive cargoes of 10,000 tonnes due to storage constraints. NPI works with 10-year contracts. Miyuki Tomari, president, Biomass Industrial Society Network: As of April 2018, Japan’s Clean Wood Act requires that biomass used for power generation must be accompanied by chain-of-custody forest certification including proof of legality. Feed-in-tariff requirements are more constrained than the Clean Wood Act. Yoshinobu Kusano, Renova: Renova is doubtful that biomass cofiring projects will not proceed as planned due to opposition to coal in Japan. Renova believes that the best solution for biomass power is construction of independent power projects with dedicated biomass boilers between 50 and 110 MW. This was the fourth consecutive year that WPAC and our members have participated in the CMT Biomass Pellets Trade & Power Conference in Tokyo. However, this was the first year that we held our golf event, became a platinum sponsor, organized and sponsored the main conference reception, and organized our own tour of a biomass power plant. Canada’s accelerating growth in wood pellet exports to Japan, coupled with our 70 per cent market share, are good reasons for us to continue with this annual event. The Wood Pellet Association of Canada gratefully acknowledges financial support from Natural Resources Canada’s Expanding Market Opportunities Program and Forestry Innovation Investment’s Market Initiatives Program. We could not have held such a successful event without their help.